Imagine that you are living inside of a video game, where everything is coming at you at once and every sight, sound and sensation is a distraction. For a child with ADHD, getting through a typical day is something like that—and it explains a great deal about how they experience the world. Children with ADHD typically have impairment of functions such as concentration, memory, impulse control, processing speed and an inability to follow directions. If you’re a parent of a child with ADD or ADHD, this most likely sounds all too familiar. 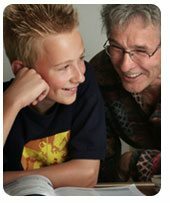 Over the years, you’ve probably struggled through homework sessions with your child, tried (and failed) to get them to complete certain tasks like cleaning their room or finishing yard work, and on more than one occasion, you’ve probably felt completely drained by their high energy and seeming inability to focus. The good news is, there is something you can do to help your ADHD child improve their concentration skills. For years it was thought that each of us was born with a generous supply of brain cells, but that we were unable to produce additional cells or make changes in how they function. Fairly recently, neuroscientists discovered the presence of something called “neuroplasticity” which enables the brain to actually grow additional cells or modify the function of existing cells. Amazingly, cognitive exercises have been found to produce desired changes in not only how the brain works, but how it looks. What this means for parents is that you now have the ability to work with your child to help improve their ADHD symptoms. As a child psychologist and the father of a son with ADHD, I developed a host of exercises that help ADHD kids improve their concentration. The key is presenting them as games that are actually fun for parents and children to do together. 1. The Coin Game: This is one of the games that we use in the Total Focus Program. Parents like it because it improves memory and sequencing as well as attention and concentration, and kids enjoy it because it’s fast-paced and fun. First, you will need a small pile of assorted coins, a cardboard sheet to cover them, and a stopwatch (or a regular watch with a second hand.) Choose five of the coins from the pile (for this example, we’ll say three pennies and two nickels) and put them into a sequence. Now, tell your child to “Look carefully at the coins arranged on the table.” Then, cover the coins with the cardboard. Start the stopwatch, and then ask them to make the same pattern using the coins from the pile. When they are finished, mark the time with the stopwatch and remove the cardboard cover. Write down the time it took them to complete the pattern and whether or not they were correct. If they didn’t complete it correctly, have them keep trying until they can do it. You can increase the difficulty of the patterns as you go, and include pennies, nickels, dimes, quarters, and half dollars. You’ll see your child’s concentration and sequencing improve the more they play, which is a great reward for both of you. 2. Relaxation and Positive Imagery: Combining simple relaxation techniques such as deep breathing with positive visual imagery helps the brain to improve or learn new skills. For instance, research shows that if a person mentally practices their golf swing, the brain actually records the imaginary trials the same as if they were real trials which leads to improvement on the golf course. So ADHD kids can “imagine” that they’re paying attention in class or able to handle teasing, and this can in turn change their behavior at school. You and your child can use your own creativity and give this a try. 3. Mind – Body Integration: An example of this technique would be to have your child attempt to sit in a chair without moving. The parent times how long the child is able to accomplish this. Repeated practice over several weeks will show improvement. Through this activity, the neural connections between the brain and body are strengthened, providing improved self-control. 4. Crossword Puzzles and Picture Puzzles: It sounds simple, but these are great tools for kids with ADHD. Crossword puzzles actually improve attention for words and sequencing ability, while picture puzzles—in which your younger child has to look for things that are “wrong” in the picture or look for hard-to-find objects—also improve attention and concentration. 5. Memory and Concentration Games: Children’s games such as Memory or Simon are great ideas for improving memory and concentration. They are quick and fun. Memory motivates the child to remember the location of picture squares and Simon helps them memorize sequences of visual and auditory stimuli. Through repeated playing, brain circuits are “exercised” and challenged, which strengthens connections and thus improves function. Also, there are some free computer games on the internet that also improve concentration or memory such as Memory and Mosquito Killer. For older children and adolescents, check out the cognitive exercises provided by Lumosity. As you do all of these “brain exercises,” you should work together with your child serving as his or her “coach.” Provide them with encouragement and track their progress as they improve. This is a win/win solution, because it also strengthens the relationship you have with your child. Go ahead. Have some fun. Do the exercises along with your child, and who knows, you may find your brain will work a little faster and smarter, too! These suggestions are provided as activities to supplement medical and/or psychological treatment provided under the guidance of a physician or psychologist. They will enhance the benefits of the treatment but will not on their own resolve serious symptoms for a child who has been accurately diagnosed with ADHD. Dr Robert Myers is a child psychologist with over 25 years of experience working with children and adolescents with Attention Deficit Hyperactivity Disorder and learning disabilities and is the creator of the Total Focus Program www.trytotalfocus.com. Dr Myers is Associate Clinical Professor of Psychiatry and Human Behavior at UC Irvine School of Medicine. “Dr Bob” has provided practical information for parents as a radio talk show host and as editor of Child Development Institute’s website, 4parenting.com which reaches 3 million parents each year. Dr. Myers earned his Ph.D. from the University of Southern California.